Apples puff pie. Recipes from Russia. 1 sheet frozen puff pastry (10,6 oz package), thawed but well-chilled. 3 medium, ripe, firm apples, peeled, cored and thinly sliced. 50 g (1,8 oz) sweet pot cheese mixed with vanilla. 2- tbsp raisins, washed, drained. 1. Preheat the oven to 400 degrees. Put pastry on lightly floured surface, roll the puff pastry into thin circle and place on baking sheet. Fold over edge about 1/2" to form rim. Prick center of pastry circle thoroughly with fork. 2. 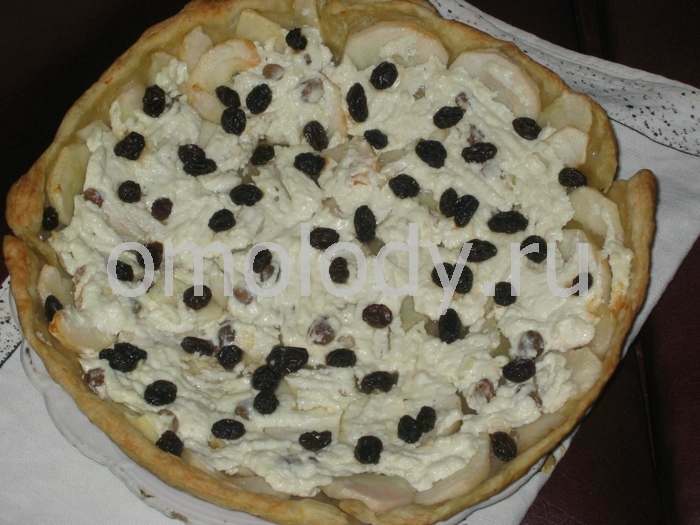 Arrange apples slices to cover the pastry, distribute pot cheese over the apples, sprinkle it with raisins. 3. Bake until the pastry edges are well puffed and a rich golden brown, the apples are tender. Remove from the oven and let cool slightly but serve warm.